How is that best of? It has a rare white "BUISNESS" banner on top of the US-6. Not uncommon in Indiana when there is a business route. Hardly a candidate for "best of". "Best" and "worst" are very subjective. One person's "man this is so cool I love it" might be another person's "meh." And one person's, "this sign is putrid" can be another's "hey I kinda like it." I've always interpreted this thread as a place to post old classic signs that are still up in the field, in addition to modern signs done to classic specifications. In my opinion, something such as a simple (but well designed) BGS isn't enough to classify it as "best of." The green uni-sign isn't best of in the slightest, but the Maine Turnpike trailblazer sure is. The directional arrow in lieu of the gold star is an old standard that hasn't been done for years. That's rare because it's hard to read and against the MUTCD. Someone better tell InDOT and MoDOT. 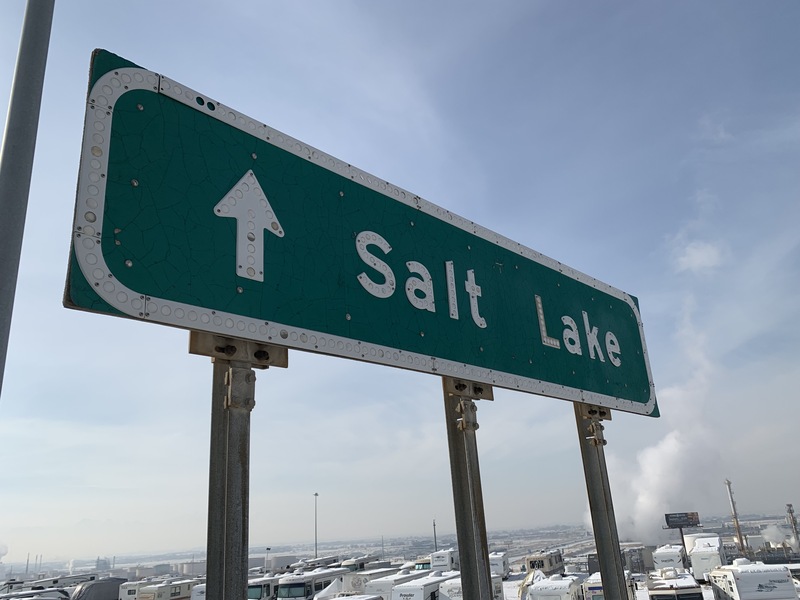 This beauty is on US 89 southbound in North Salt Lake, Utah, just before the I-15 interchange. I couldn't find a date sticker, but it seems quite likely that it dates back to when this road was also US 91, and it could well predate the Interstate. you keep posting in the wrong thread - they belong in Unique, Odd, or Interesting signs aka the good, the bad, and the ugly. The last time I visited St. Louis, in the spring of 2016, I depended heavily on SR 3 because it was the most convenient route between downtown St. Louis and my lodging near the Chain of Rocks Bridge on the Illinois side. The I-55/I-64/SR 3 cat's cradle is just very difficult to sign, even with I-70 now partially out of the picture, and I would contend it is one of the poster children for "Don't build it if you can't sign it." Interesting. It doesn't look that old, though—at least not in that picture. I am uncertain of its age. There is at least one other yellow yield sign on the UW-Seattle property (in the underground parkade). It's possible they were both installed some time after the current red/white design was introduced, but not long enough for the school engineers to have adopted it. Considering the white-painted wooden pole (an old Seattle standard that's rarely seen anymore), and the custom painted font, the sign is undoubtedly from the past century...maybe the late 70s or early 80s. meh. I can think of three others on US highways in Missouri right off the top of my head. The '67' on the sign in Poplar Bluff is screwed up too. 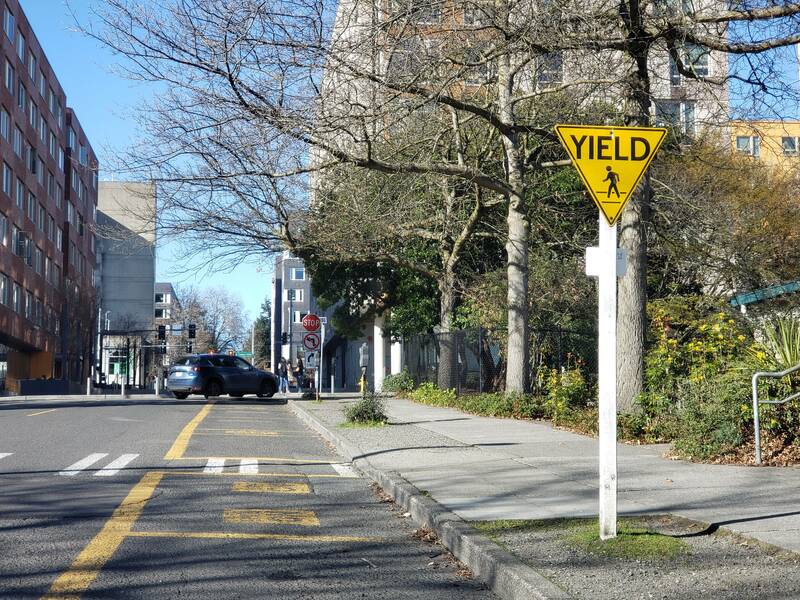 Or it's telling peds to yield. I guess in East St Louis they have no choice but to sign something like this. Too many highways just happen to all join together at one interchange. A similar situation in Colton, CA (and other freeway junctions) in the 1960's was one of the impetuses for the great highway renumbering of 1964 in California. There are a lot of highways to keep track of here. CA has the luxury of being in the corner of the country, so they can truncate national routes that no longer make sense to sign. And CA has done so many times. You can't do that in St. Louis. I don't know why it says "unattributed" -- that's one of the more famous images from California Highways and Public Works. I'm pretty sure I have that issue around here somewhere.